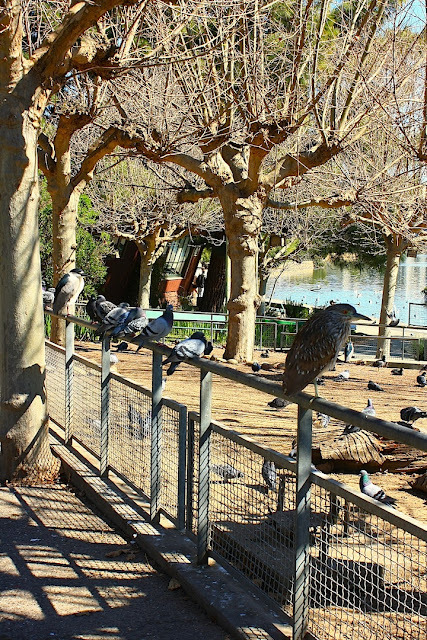 Lake Merritt is the country's first official wildlife refuge, designated in 1870. It attracts many bird species who use it as part of their migratory flyway. Lakeside Park is one of the lake's features and is where many birds come to be fed. If you squint hard you can see a water reflection in the background. For more reflection photos, visit James' meme, Weekend Reflections. and no matter what, the pigeons will tag along! Love this picture! Poor birds trying to live by our rules. I sincerely hope that it was not the last :-) Very important in modern societies. PS Thank you for the comment - it may be as you say, or it may reflect very cultural differences. I believe that is a Bittern closest to you. I guess it is use to people sitting there like that. Can't make out the large bird on the other end...it's mate? Did not know of Lake Merritt's notoriety. I see the ubiquitous pigeons, but curious what bird is front and center. Love Lake Merritt. If you walk around and see a pedestal with dolphins (it is sappy, and not my favorite) we created it. It was a reproduction form an earlier one, so the design is not ours, but it was our sculpture work and our manufacturing work :-). Very interesting. It looks like a great park. We live in a bird sanctuary, but we don't see many intersting looking bird species. How far from Oakland is this wildlife refuge? I can do without the pigeons but that bird in the foreground is lovely! Others have noted the (is it a heron?) in the front, and I also see a bird which is not a pigeon, farther back. Oh, and there is a reflection, too! I grew up in Modesto, and spent a lot of time in San Francisco, but not so much in Oakland. Thanks for sharing this sight! What a terrific spot for bird photography!